Prepare to get Served! It's "Cloudy with a chance of Meatballs"
Tired of people telling you what you can and can’t eat? Disappointed that you have to stomach the same boring foods day in and day out? Waiting for the day when you can just order whatever you want, whenever you want? Well, the wait is over. 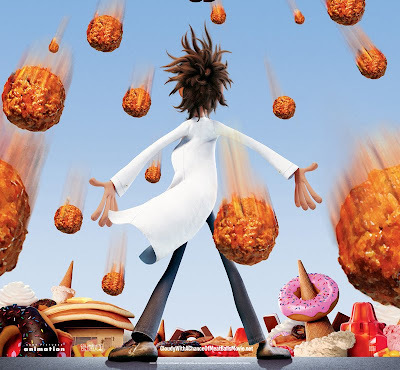 This season, prepare to get served by Columbia Pictures’ “Cloudy with a Chance of Meatballs” -- a hilarious adventure of epic… portion sizes. Inspired by the beloved children's book, the film focuses on a town where food falls from the sky like rain! In the No. 1 U.S. box-office hit, aspiring inventor Flint Lockwood (voice of Bill Hader) is the socially awkward genius behind some of the most bizarre contraptions ever conceived. But even though all of his inventions, from spray-on shoes to a monkey thought translator, have been spectacular failures that caused trouble in his small town, Flint is determined to create something that will make people happy. But when people greedily ask for more and more food, the machine starts behaving erratically, unleashing spaghetti tornadoes and giant meatballs. With the town about to be buried beneath mountains of marshmallows and waves of watermelons, it’s up to Flint and Sam to use their combined expertise to shut down the machine and put everything right. The film features the voices of Bill Hader, Anna Faris, James Caan, Andy Samberg, Bruce Campbell, Mr. T, Benjamin Bratt, Neil Patrick Harris, Al Roker, Lauren Graham, and Will Forte. The film is written for the screen and directed by Phil Lord & Christopher Miller. Based upon the book written by Judi Barrett and illustrated by Ron Barrett.